This compact urban site presented all the characteristics of a typical inner Melbourne workers cottage, with a once sundrenched living area over time being landlocked by the archetypal lean-to addition of bathroom, kitchen and laundry. 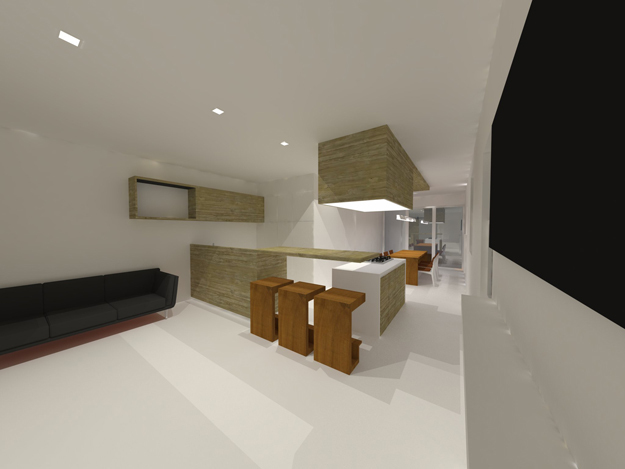 Presented with the budget conscious challenge of reconfiguring the dysfunctional interior program, we proposed to reorganise the limited space into a condensed open plan dining, kitchen and living sandwich. Positioning the kitchen centrally, to form the heart of the home, compact and multifunctional joinery blurs the boundaries between each of these spaces. The client’s preference to use reclaimed materials informed the decision to line the joinery elements in an assortment of recycled timbers that add texture without over-complicating the interior resolution. A carefully considered lighting scheme draws out the richness of the timber lining to enliven the once dull interior. The dining area flows through to an outdoor deck to unlock the interior connection to the backyard.